To each module of the School of Witchcraft an adequate online course starts periodically. This course attends the participants through the whole module. Every student gets daily or weekly schedules including little exercises, errands for e.g. an upcoming ritual or something to read by e-mail. During the weekends there will be a bit more to do. When it’s possible we try to offer exercises in family versions to integrate also them. After a few weeks there will always be a short resting period so that the things you’ve learnt can mature. 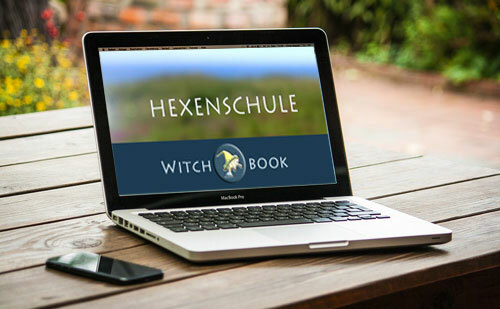 The Witchbook is our virtual classroom. It is absolutely private, which means that anything discussed, asked, liked will stay private at all. Here you can also find private groups which belong to the adequate online course and module including articles, exercises, discussion and so on. So you will not only be private insode the whole Witchbook but also inside the specific groups. However, every student can also discuss in the public area of the witchbook which can be accessed by all other students. This is also the area someone who has ordered single scripts has access to. Learning together is not only more fun, it also supports personal development! Therefore, we invite your spouse (or partner) or one of your adult (!) children to participate at a reduced price of over 50%, namely 75,- per module! The training partner receives the same program as the “main participant”. Of course, the partner must also be of legal age! The offer is valid for one person and only in combination with a regular booking of the same module!